In our effort to continue growing and improving the ProStar Fastpitch program we are proud to announce the addition of Kaci Tilley to our 16 under team. Kaci is a 2019 graduate and attends Rhea County High School. Kaci brings a power bat to our team and is expected to contend for a spot in the middle of the batting order. We expect her to be a home run hitter and provide protection for some of our already strong bats. On the defensive side of the ball she is true utility type of player capable of playing every position except catcher. She is quite capable of being a starter at one position for us but we envision her being able to play any INF and OF position. She will also log some innings in the circle. She has been a member of some strong ASA teams out of the Knoxville area. ProStar Fastpitch would still entertain the idea of adding one more player to our 16 under roster and would definitely like to add a couple of strong 14 under players to round out our roster. Members of the ProStar Coaching staff are : Gary Hammontree / Cassie Frogge / Rebecca Holcomb / Teri Kokinda / Harry Turner / Shelby Hammontree / Ali Roberts / Meggan McRoy / Katie Pritchett / and Steve Chattin. 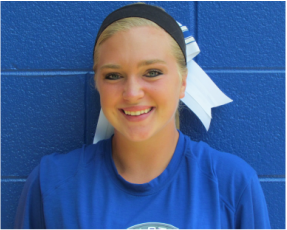 I am excited to announce that we have added Alaina Reece to our ProStar Fastpitch 16s roster. Alaina is a potential game-changer in the middle of our line-up. She is a 3B / 2B / C that will bat in the 3-5 slots in the batting order. She has natural God-given talent of power and speed. I project her to play more Catcher in the spring with Savannah Turner in HS ball and more infield in the summer exposure season. Alaina attends Calhoun High School and has been a member of their State Championship teams and has played at an extremely high level in Elite Select ball. In football terms she is a 5-star recruit and will immediately be one of the top two or three athletes in our program. More importantly she wants to improve and has a very high motor to compete and win! She comes highly recommended and performed outstandingly at her tryout. Shelby Hammontree to sign with University of North Georgia. ProStar Fastpitch and Coach Chattin would like to congratulate Shelby Hammontree on her signing scholarship papers this week with Division II National Champs The University of North Georgia. Shelby is currently a member of the ProStar 16 under coaching staff and was an original member of ProStar in Year 0. She currently is the starting catcher for the Frost Cutlery Falcons and just finished an outstanding career at Heritage High School where she received numerous athletic and academic honors including 2 time All-State Catcher. She is also a member of the Beta Club , the National Honor Society, and currently carries a 4.0GPA. Shelby was an original member of the summer travel program that Coach Chattin started as part of the Heritage High School program. She has developed from a 12 year old talent searching for her place in the softball world into a stunning and talented young lady that has used her softball skills to further her academic and lifetime goals. Coach Chattin released this statement: "I would like to congratulate Shelby and her family on her signing with the University of North Georgia. It has been my pleasure to coach her the last 6 years and to have her as a member of our coaching staff this year. Shelby is not only talented but she has one of the best hearts of anyone I have ever coached. She cares for the game / her teammates / and her coaches. She is absolutely the finest combination of ability, work ethic, and loyalty that I have ever had the pleasure to coach. I expect her to do great things not only at North Georgia but in her life. I am very proud to call her a former player, coach, and friend." Shelby and her family will hold a signing ceremony on Thursday November 12 in the Heritage High School auditorium at 10am. All family, friends, and members of the ProStar family are invited to attend and celebrate with Shelby. Please arrive by 9:45 if you plan to attend.